Alyson R. Marcucio practices in the firm's estate planning and probate group, with considerable emphasis on elder law. 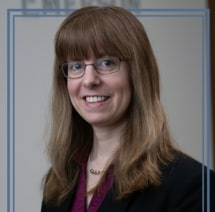 Alyson's goal-oriented approach toward advising clients eases the often complicated asset transfer process and results in estate plans tailored to each client's unique circumstances. Her practice in elder law includes long term care, incapacity and special needs planning, eligibility for Medicaid and other public benefits, and conservatorship proceedings. Alyson rounds out her practice by assisting families to navigate the probate process, whether in administering estates or managing trusts. Alyson's personal approach to addressing each legal matter helps her clients feel comfortable during the process of planning and administering their affairs.